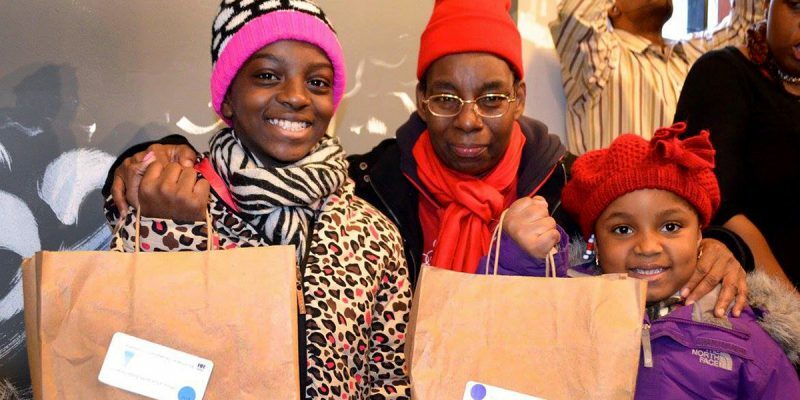 West Harlem Development Corporation (WHDC) gave away hundreds of toys, books and other treats to a crowd of almost 700 at its 4th Annual Community Holiday Celebration and Toy Giveaway on Saturday, December 10, 2016 at Columbia University’s Miller Theatre. At the event, World Childhood USA introduced its mobile app, Stewards of Children Prevention Toolkit. This first-of-its kind app equips adults with the skills to prevent, recognize, and respond to child sexual abuse (www.socapp.org). Together with its partner, Noah’s Arc Foundation, Childhood USA held a drawing contest for children on the theme, “Every Child Deserves…” Noah’s Arc Foundation supports victims of gun violence and was founded in Chicago by NY Knicks NBA player Joakim Noah and his mother, sculptor and former Miss. Sweden, Cecilia Rodhe. WHDC gained a valuable partner, Infrastructure Engineering, Inc., a minority-owned firm with proven record in the Midwest that is in the process of establishing an office in Harlem. Alex Brand Toys and Ravensburger Toys donated quality toys for the children and First Book added excellent books that fit into tote bags donated by NY Public Library. Each attendee was treated to chocolate drink by Fairway Market on their way out into the cold. Columbia University contributed the theater space, Mt. Sinai School of Medicine made sure there was potable water for each attendee and Janus Properties did their part with a contribution. WHDC-funded arts and culture organizations entertained the crowd with Dominican, Gospel, and Opera numbers as well as dance acts that featured teens dancing to Hip Hop and senior citizens getting the audience moving with their spry lyrical moves. It was a sight to see WHDC’s Executive Director, Dr. Kofi Boateng, join the dancers on stage. National-champion gymnasts rounded out the variety show before educational toys and books were given away in goody bags. “It is great to celebrate the holiday season with WHDC. This year, we are sharing our mobile app to help the community prevent child sexual abuse,” said World Childhood USA President and CEO, Dr. Joanna Rubinstein. “We do toy giveaway programs in Chicago. We are delighted to have found a very caring partner in WHDC to get off to a great replication in New York City. We believe that these occasions are superb motivations for young children to aspire to be positive contributors to society,” said Mr. Michael Sutton, President & CEO, Infrastructure Engineering. WHDC thanks all the contributing organizationsfor their generous donations of toys, books, space and funds to provide the children of West Harlem with quality educational toys and books. Contact WHDC at 646.476.3394 if your organization wants to be a partner for the 2017 celebration. Solutions Through Collaborations. West Harlem Development Corporation is a 501 (c) (3) nontaxable nonprofit organization, focused on the progression and increase of economic opportunities and quality of life of the vibrant community of West Harlem.